No one wants to find crusty green deposits, murky green water or staining, or velvety, splotchy-looking green mold on bathroom fixtures. These green or blue-green discolorations can develop on the surface of the sink, around the fixtures and on the actual metal of the faucet and taps. A number of things can cause bathroom sinks and faucets to turn green. Some reasons are more easily solved than others. Mold can cause orange, red, brown, black, white or green stains and accumulations to grow over a bathroom sink, drain and fixtures. Mold thrives in wet environments. Don't overlook a mold problem. In addition to cosmetically altering your sink, mold can pose a health hazard. Respiratory conditions, skin and eye irritation and organ conditions can develop from exposure to mold growth. If mold is turning your sink, drain, faucet and taps green, clean the sink with a mold-removing household cleaner. To prevent the future buildup of mold, dry the sink, faucet and taps thoroughly with a towel following every use. 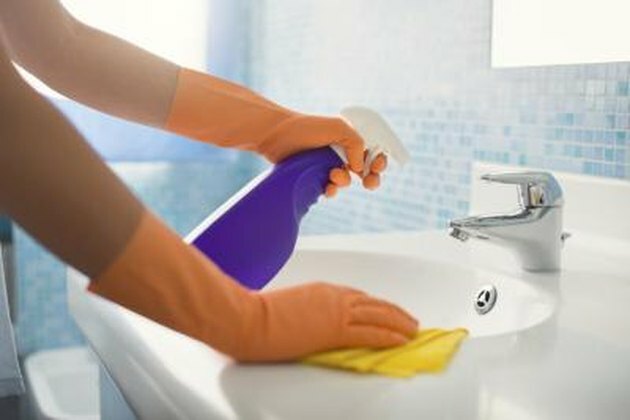 Spray the sink with a disinfecting spray at least twice a week. Copper sink fixtures, like all copper products, will turn green over time due to oxidation. When copper is exposed to oxygen, the color changes to green. Most copper bathroom fixtures are coated with a transparent enamel or plastic material to protect the copper from discoloration, but water can deteriorate the coating. When the protective covering is breached, oxygen penetrates the copper, allowing it to turn green. Sometimes chemicals added to water to treat the water supply are the culprit in the breakdown of the protective coating. Chlorine contains sodium hypochlorite which is used in bleach. This chemical is a potent oxidizing solution that is added to public water systems. If you suspect oxidation of your fixtures, which can lead to discoloration of the sink's surface, clean the faucet with white vinegar. The vinegar removes the green, but won't stop the fixtures from continuous oxidation. In houses constructed before 1986, copper pipes were widely used. Today, houses have less copper plumbing, but it is not unusual for copper pipes to be present. If your water has a greenish tinge, it could be because the copper pipes are being eroded. Erosion of copper pipes can be caused by minerals or acid in water or aging copper plumbing. A streak of green stain below a perpetually leaky faucet is a sign of pipe erosion. Water high in acid will leave blue-green to green stains on the sink and faucet because the acidic water erodes copper pipes. 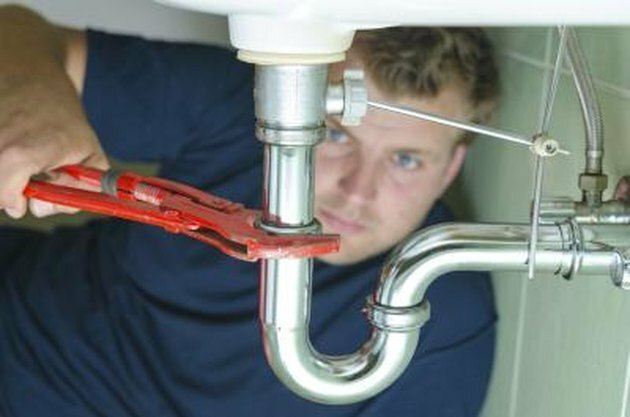 This might pose a health risk, so contact a plumber to investigate. Copper pipes are soldered with lead, erosion of pipes can cause lead contamination to seep into your water. Extremely low or high pH levels can cause copper pipes to discolor water and stain your sink and faucet green. Use a home water testing kit to determine the pH level in your water. According to North Carolina Cooperative Extension Service, your water should test as near a neutral level, which is pH 7, as possible. Water softener systems can be installed in your home to alter the pH levels in the water. Severe pH issues that have proliferated over time may result in damaged pipes. 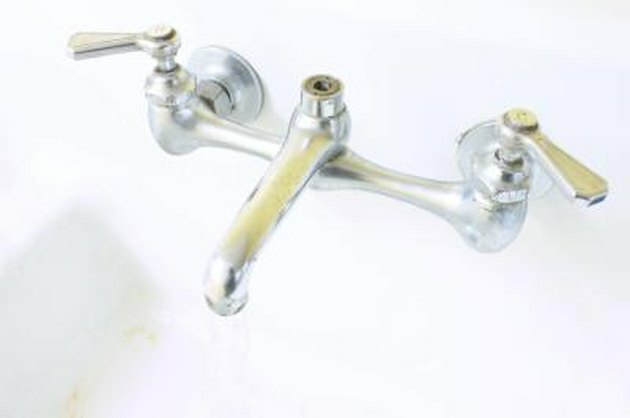 You might have to treat your water to prevent future staining of your sink and faucet. Why Is My Shower Mat Turning Orange?